Here is a picture of me (on the left) with my friend Mary. We met on MQResource (an online machine quilting site) but had never met in person. The quilts in the background are made and quilted by Marilyn Badger, a well known quilter who lives in StGeorge. We got to meet her one day. What a treat! I am home now and working away on projects I had left midstream. One I have to skin off the backing. I didn't know just how awful the tension was till I learned how to FIX it! Guess what I will be doing infront of the TV this week! What fun for the two of you!! That's what we call "good" exhaustion. Frogging is not a fun way to spend the holiday! Usually bad tension comes out easily... here's hoping. A neat trick I learned was to take a silicone (NOT rubber) spatula and rub it across the fabric when done with the frogging. It pulls out all those little bits of thread left from cutting stitches. Works like a charm! Good luck with it, and happy 4th! Sounds like a fun trip. Enjoy your new toy! 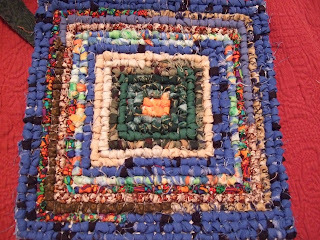 I feel for you, I have a frogging project about half done....YUCK! 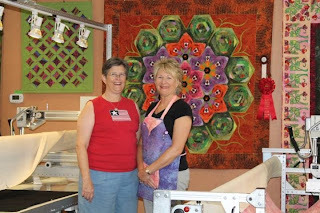 Good to meet another Arizona Innova quilter! I'm going up for taining in October, can't wait!